Toshiba launches four new business notebook computers included in its Satellite Pro S300 series, which is equipped with the company’s EasyGuard Technology. The Satellite Pro S300-EZ1511 is a15.4-inch computer running on Windows Vista Home Basic with an Intel Pentium T3400 processor, and featuring 1GB DDR2 SDRAM memory, 120GB storage,DCD Super Multi optical drive, the Mobile Intel Graphics Media Accelerator 4500M, Atheros 802.11 b/g wireless LAN, and eSATA/USB Combo Sleep and Charge port. It is available at an affordable price of $529.Next there’s the Satellite Pro S300-EZ1512 coming with Windows Vista Business operating system pre-installed, an Intel Pentium T3400 processor, 1GB DDR2 memory, 120GB storage capacity, DVD burner, Mobile Intel Graphics Media Accelerator 4500MHD, Atheros 802.11 b/g wireless-LAN, eSATA/USB Combo Sleep and Charge port, and a 15.4-inch TruBrite widescreen display, allpacked for just $579. 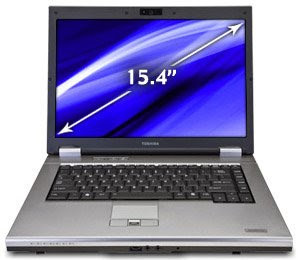 If these first models didn’t meet all your needs, then let’s try the Toshiba Satellite Pro S300-EZ1513. This laptop has Windows Vista Business, the Intel Core 2 Duo T6400 processor, 1GB memory, 160GB storage, DVD buirner, Intel WiFi Link 5100AGN5, eSATA/USB Combo Sleep and Charge port, and the TruBrite display of the same size as the previously describers models. It has a price of $649.You can also opt for the fourth configuration available on the Toshiba Satellite Pro S300-EZ1514 notebook, which comes at $699 with an Intel Core 2 Duo T6570 processor, 2GB of memory, 160GB storage, the Wi-Fi module, built-in web camera, and all the other features of the Toshiba Satellite Pro S300-EZ1513. "The two-year warranty further differentiates our Satellite Pro S300 business products from the rest in the industry and is now selling for a first-time price point of $529," said Carl Pinto, vice president of Product Development & Marketing of Digital Products Division, Toshiba America Information Systems.